A Nobel Prize-winning scientist is considering a run for Minnesota's U.S. Senate seat in 2008. Dr. Peter Agre, a Minnesota native, says he'll decide this summer if he'll enter the race with comedian Al Franken and attorney Mike Ciresi for the DFL nomination. The winner of that race would challenge incumbent Republican Norm Coleman. 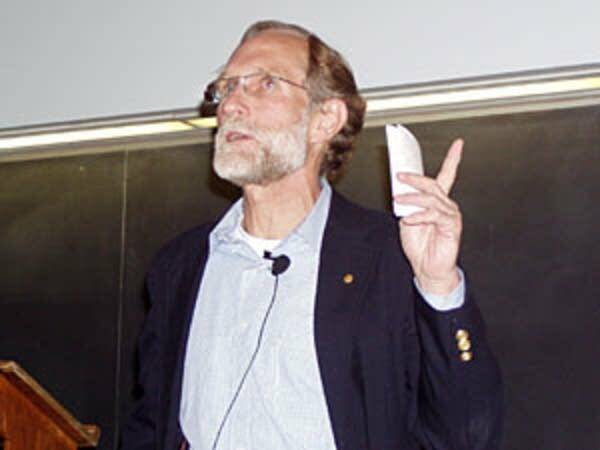 Agre won a share of the 2003 Nobel Prize for chemistry. Although Agre's family has lived in Minnesota for four generations, he himself hasn't resided here in more than 25 years. He grew up in Northfield and Minneapolis, and graduated from Augsburg College in Minneapolis. Agre is currently the vice chancellor for science and technology and a cellular biology professor at the Duke University Medical Center. Agre came to Duke in 2005 after spending more than 25 years at The Johns Hopkins University School of Medicine in Baltimore. Agre says he's considering entering politics because he's concerned about what he calls the politicization of scientific research on such issues as global warming. He is also in favor of embryonic stem cell research. MPR's Greta Cunningham spoke with Agre.